$5.00 FOR A FIRST OR LAST NAME. $15.00. 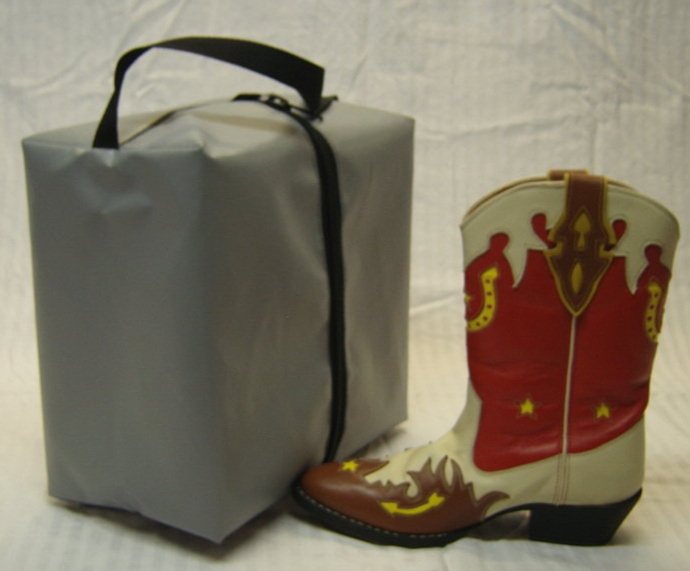 THE BOOT BAG IS A SPECIALTY BY (YOU GOT IT) OFFSHORE WORKERS. 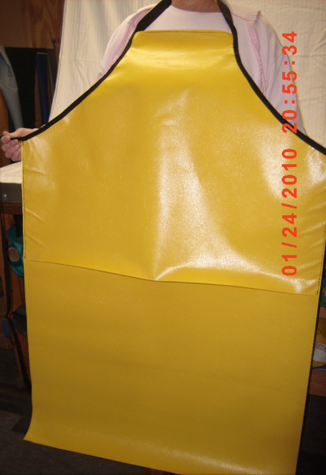 WE HAVE ADDED IT TO OUR STANDARD BAGS BECAUSE OF ITS POPULARITY. IT ROUGHLY FITS INTO THE END COMPARTMENT OF THE LARGE BAG. IT WAS DESIGNED TO SEPARATE DIRTY WORK BOOTS FROM OTHER GEAR. IT WILL HOLD UP TO A SIZE 12 BOOT (THEY SAY). WE LIKE IT TO STORE JUMPER CABLES IN. 11" x 12" x 7". $25.00 THIS APRON WAS DESIGNED BY MY FATHER WHO WAS A COMMERCIAL CRABBER. HE SAW THE FABRIC THAT WE MADE THE BAGS FROM AND SUGGESTED THAT IT WOULD MAKE A REALLY STRONG APRON AND WOULD BE COOLER THAN A RAIN SUIT TO PULL TRAPS IN. THE TOP 25 INCHES IS DOUBLED, IT IS APPROXIMATELY 25 INCHES WIDE AND 46 TO 48 INCHES LONG. THE NECK STRAP IS 24 INCHES AND THE TIES ARE 40 INCHES. IT'S NUTTHIN' FANCY BUT IT DOES THE JOB WELL. 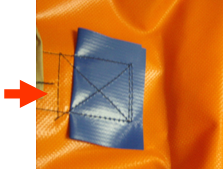 Check out the double stitching and extra backing that is our standard. IF YOU DIDN'T BUY FROM 'BAGS UNLIMITED' YOU DIDN'T BUY THE BEST!